[192 Pages Report] Automation-as-a-service enables organizations to mechanize the business processes by capturing and interpreting data from existing applications. It enables organizations to shift from slow manual processes to reliable, fast automation across the organization in a matter of hours or even minutes. 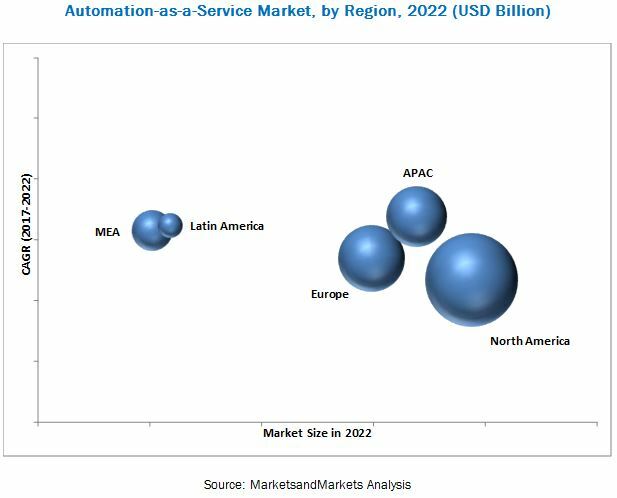 The automation-as-a-service market size is expected to grow from USD 1.56 Billion in 2016 to USD 6.23 Billion by 2022, at a Compound Annual Growth Rate (CAGR) of 28.1%. 2016 is considered to be the base year, while the forecast period is 2017–2022. The research methodology used to estimate and forecast the automation-as-a-service market began with capturing the data on key vendor’s revenues through secondary research sources, such as companies’ websites, Factiva, and Hoovers. The other secondary sources included annual reports, press releases, and investor presentations of companies; white papers and certified publications; and articles from recognized authors, directories, and databases. The vendor offerings were also taken into consideration to determine the market segmentation. The bottom-up procedure was employed to arrive at the overall market size of the global automation-as-a-service market from the revenue of the key players in the market. After arriving at the overall market size, the total market was split into several segments and subsegments, which were then verified through primary research by conducting extensive interviews with the key people, such as Chief Executive Officers (CEOs), Vice Presidents (VPs), directors, and executives. The data triangulation and market breakdown procedures were employed to complete the overall market engineering process and arrive at the exact statistics for all the segments and subsegments. The breakdown of profiles of the primary is depicted in the below figure. The automation-as-a-service ecosystem comprises vendors, such as Automation Anywhere, Inc. (US), Blue Prism Group plc (UK), International Business Machines Corporation (US), Microsoft Corporation (US), UiPath (US), HCL Technologies Limited (India), Hewlett Packard Enterprise Development LP (US), Kofax Inc. (US), NICE Ltd. (Israel), and Pegasystems Inc.(US). 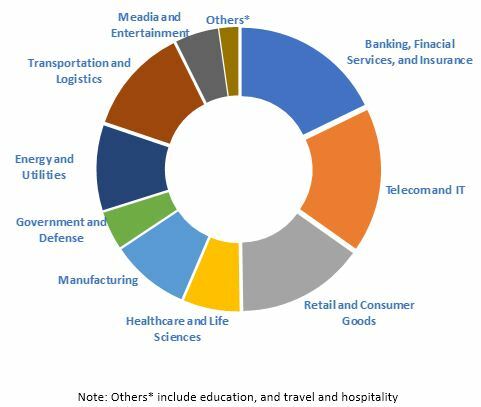 The other stakeholders in the automation-as-a-service market include automation service providers, consulting service providers, Information Technology (IT) service providers, resellers, enterprise users, and technology providers. Automation involves mechanizing a series of operations by capturing and interpreting the existing repetitive and high-volume business processes. Automation deals with triggering responses, manipulating data, and communicating with other digital systems, which usually calls for tremendous labour and monotony. Automation implemented as a subscription-based service and delivered via the cloud is referred to as automation-as-a-service. Moreover, the automation-as-a-service model enables organizations to shift from slow manual processes to reliable, fast automation across the organization in a matter of hours or even minutes. The increasing demand for automation and the increasing adoption of cloud technology are expected to be the major drivers for the growth of the automation-as-a-service market. Business functions such as IT, finance, marketing and sales, operations, and HR are currently experiencing a rapid growth. Thus, there is an enormous market potential for automation across numerous business verticals, owing to its ability to perform the mundane or error-prone parts efficiently. Automation is highly useful in industries, such as BFSI, healthcare, and telecommunications and IT, as these industries follow defined, repeated, and rule-based processes. Automation reduces inconsistencies in the business environment and eradicates errors created by manual work, thereby enabling effective business processes. SMEs hold a major role in defining the world’s economy. SMEs, as defined by the European Commission (EC), are organizations that have than 250 employees, with an annual turnover of up to USD 60 million (approximately EUR 50 million). SMEs comprise 99% of the overall companies in the European Union (EU) alone. Most often, large organizations outsource their services to SMEs. SMEs’ adaptive capabilities provide a backbone to define the global economic structures. Earlier, it was believed that only large organizations can benefit from the automation of processes. Eventually, technology has become an integral part of everything a business does, and so, SMEs can also reap great benefits by automating their IT, finance, HR, operations, and marketing and sales processes. SMEs are reluctant to invest in automation-as-a-service, due to the fear of not gaining any RoI. Automation solutions provided on the cloud can be valuable for the SMEs, as they do not have enough resources to invest in manpower. Moreover, investing in these solutions can streamline the business processes, thereby making the business more profitable. As the advantages of automation-as-a-service are recognized, more SMEs may adopt these solutions; and the wide adoption of automation-as-a-service among the SMEs is expected to boost the growth of the market. The automation-as-a-service market is expected to grow from USD 1.80 Billion in 2017 to USD 6.23 Billion by 2022, at a Compound Annual Growth Rate (CAGR) of 28.1%. The major growth drivers of the market include the increasing demand for automation and the increasing adoption of cloud technology. The market is segmented by solution and services. 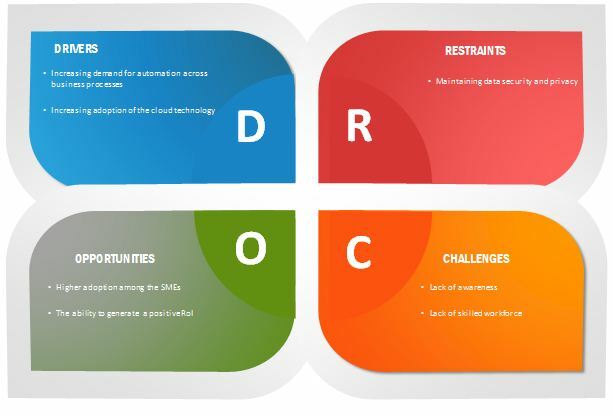 The services segment is expected to grow at the highest CAGR during the forecast period, out of which, deployment and integration services in the professional services segment is projected to witness the highest demand, due to the growing need of automation-as-a-service solutions across organizations. The Banking, Financial Services, and Insurance (BFSI) industry is expected to hold the largest share of the automation-as-a-service market in 2017. The growth is fueled by the growing need to simplify the workload related to security and the increasing dependence on workers, for monitoring every financial transaction. The healthcare and life sciences industry is expected to grow at the highest CAGR during the forecast period, due to the increasing need to store and manage data coming from various patients and medical devices and medical record systems, used across healthcare organizations. The major business functions for which the automation-as-a-service is deployed include the IT, sales and marketing, operations, finance, and Human Resources (HR). The adoption of automation-as-a-service for sales and marketing is expected to increase significantly in the coming years because of the increasing need to automate repetitive tasks and streamline the business process across industries. Organizations are deploying automation-as-a-service solutions either on the public, private, or hybrid cloud. The demand for hybrid automation-as-a-service solutions is expected to grow, due to its cost-effective and scalable features; its growth is expected to be high, particularly in the Small and Medium-sized Enterprises (SMEs), where low-cost solutions along with high data privacy are largely required. Organizations are opting for rule-based or knowledge-based automation. The demand for knowledge-based automation solutions is expected to grow, due to its ability to deal with the increasing amount of unstructured data across all organizations with greater efficiency and lesser dependency on manual handling. The global market has been segmented on the basis of regions into North America, Europe, Asia Pacific (APAC), Latin America, and Middle East and Africa (MEA). The North American region, followed by Europe, is expected to continue as the largest revenue-generating region for the automation-as-a-service vendors, for the next 5 years. This is mainly because, in the developed economies of the US and Canada, there is a high focus on innovations obtained from Research and Development (R&D) and technologies. The APAC region is expected to be the fastest-growing region in the automation-as-a-service market because of the increasing adoption of automation and cloud technologies, and various other government initiatives, such as smart cities across the APAC countries, including China and India. The automation-as-a-service market faces challenges, such as maintaining data security and privacy, and lack of skilled workforce. Factors such as lack of awareness of automation-as-a-service is expected to limit the market growth. The major vendors that offer automation-as-a-service software and services globally are Automation Anywhere, Inc. (US), Blue Prism Group plc (UK), International Business Machines Corporation (US), Microsoft Corporation (US), UiPath (US), HCL Technologies Limited (India), Hewlett Packard Enterprise Development LP (US), Kofax Inc. (US), NICE Ltd. (Israel), and Pegasystems Inc. (US). 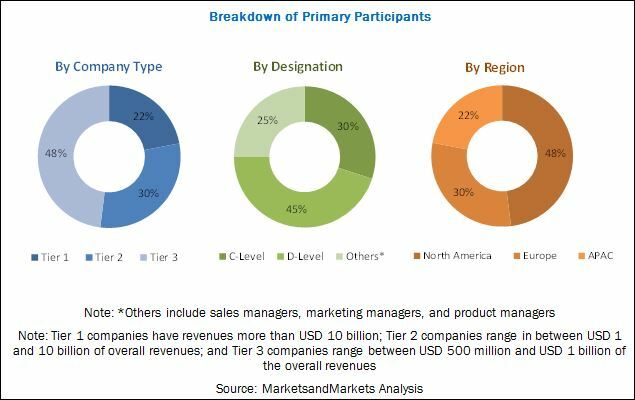 These vendors have adopted different types of organic and inorganic growth strategies, such as new product launches, product upgradations, partnerships, collaborations, agreements, and acquisitions, to expand their offerings in the automation-as-a-service market. The growth of automation-as-a-service market is depending on the factors such as demand for automation across business processes and adoption of cloud technology, which in turn has fuelled the demand for effective automation-as-a-service solutions. In the BFSI industry, multiple systems are linked with each other by interfaces to enable the flow of transaction-related data. Automation solutions control and monitor these interfaces to ensure seamless execution of transactions and fix bottlenecks in workflows. These solutions improve the accuracy and efficiency of various processes in the industry, and help in regulatory and compliance reporting by collating data from multiple systems and conducting a host of validation checks to prepare information for detailed analysis. The telecom and IT industry is increasingly adopting automation to reduce its operating cost and improve the operational efficiency and customer satisfaction. The benefits of automation for this industry include centralization and consolidation of request management systems for enhanced efficiency, improved transparency, and visibility for service functions; automation of Service-Level Agreement (SLA) reporting; and reduction of manual efforts, thereby helping in reducing errors and operational costs through process automation. Automation solutions, adopted across the entire value chain in the retail and consumer goods industry, effectively reduce the workload and provide process optimization opportunities to retailers and marketers. Benefits of adopting automation-as-a-service solutions include real-time communication with customers, increase in brand loyalty, handling warranty and replacement of products, and increase in sales. The healthcare and life sciences industry industry struggles with paper-intensive workflows, such as patients’ medical records, customer care records, patients’ credentials, processing of claims, and revenue cycle management. Demand for document management, need to enhance patient care, and competitive landscape in the industry fuel the demand for automation solutions that can significantly increase the productivity of organizations, operating in the industry, despite the growing pressure of regulatory and compliance requirements. The manufacturing industry is increasingly adopting automation-as-a-service for various workflows, such as vendor management, purchase order management, request for quotation, and inventory management. Automation enables manufacturers to automate and monitor their manufacturing activities by tracking day-to-day workflows. It results in increased productivity and reduced operational cost by eliminating routine manual and clerical tasks, thereby minimizing the manufacturing lead time. Increased budgetary constraints, for instance, reinforce government agencies to look for low-cost technology solutions that meet their diverse requirements while adhering to their strict regulatory and compliance framework. Automation-as-a-service solutions are increasingly adopted by organizations in this industry, given the low-cost benefits of cloud-based solutions and other advantages, leading to the growth of the automation-as-a-service market during the forecast period.
? The energy and utilities industry is rapidly adopting advanced technologies to gain an edge in the competitive market. The automation-as-a-service solution can benefit energy solution providers by enabling them to consolidate their data sources in the cloud, and by analyzing individual consumers and targeted segments in real time. It leads to a faster collection of overdue invoices and unbilled income, forecast demand and revenue accurately, and process automation, thereby providing real-time benefits. The transportation and logistics industry deploy automation solutions across various phases of its value chain, from supply chain to customer experience management. Automation-as-a-service enables better management of all transportation activities throughout an enterprise’s supply chain, thus helping reduce freight costs, optimize service levels, and automate processes. It simplifies various workflows in the logistics industry, such as order collaboration, communication and network-wide transportation management, and supply chain from shipper to carrier to customer. The media and entertainment industry is benefiting from automation-as-a-service significantly. The automation-as-a-service solution enables companies to virtualize their supply chain, automate workflows, and eliminate the use of multiple disparate systems across various departments and regions. Virtualization through automation-as-a-service enables the companies to provide centralized access to their resources and reallocate human resources to better-suited tasks, thus enhancing efficiency, reducing costs, and boosting monetization. Which are the top use cases where automation-as-a-service can be implemented for revenue generation through new advancements such as AI and cloud computing? What are the potential opportunities in the adjacent markets, such as robotics process automation and workflow automation?